If you have done the above, we can go on to setting it up in Apsis. Step 1: On you helloretail user, navigate to Newsletter Content > Auto campaigns and click Edit auto campaign config. 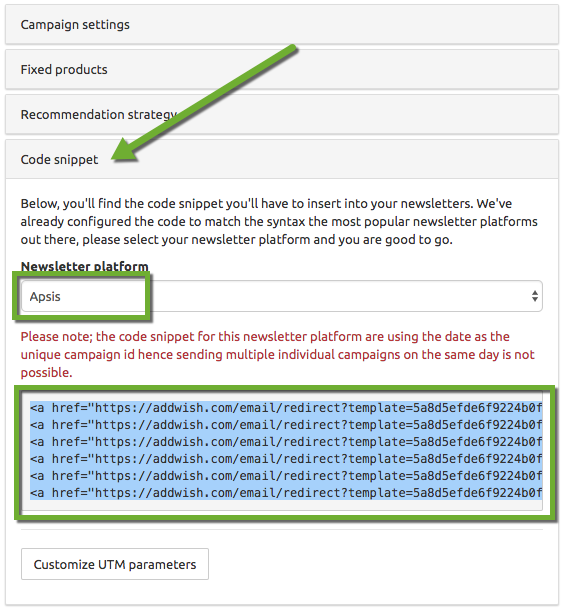 Step 2: Click Code snippet and make sure, you have selected Apsis in the drop down. Copy the code to the clip-board (CTRL+C / CMD+C). Step 3: Go to you Apsis account and click the gear icon. Step 4: Click the tab Modules and then New module. Paste the code to the empty box (CTRL+V / CMD+V). Step 5: Give the new module a name and press Save. You can edit the size to fit your newsletter layout. Step 6: Go back to the start page in Apsis, and create a new newsletter or edit an existing. 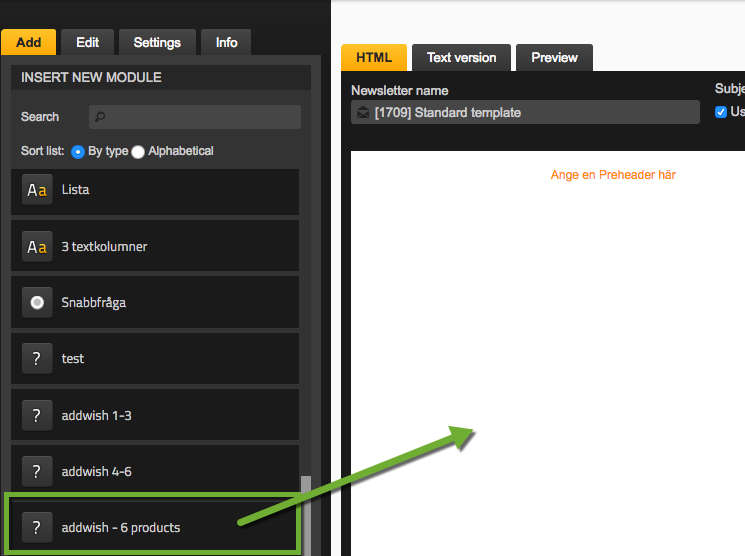 Step 7: Drag the newly created helloretail module into the newsletter where you want the products shown. Step 8: Most likely you will not see products right away so click the Preview tab. Step 9: Select an email address to see a preview of a generated newsletter with recommendations. You are now good to go. Of course, you are free to play around with the amount of products, and the size of the module.